Attleboro improved last season, scoring 18 goals and showing signs of an improved passing game, which head coach Steve Santos has been trying to build over the past few years. An exciting group of younger players added speed to the Bombardiers and the team’s increased depth allowed them to be competitive against even the league’s best teams. That group has continued to develop and sophomore forwards Isabella Salviati and Briley Harnois will be counted on to provide a consistent threat to the opposition defense. The midfield should be a strength for the Bombardiers this season with a group of versatile players that will set the foundation for the Attleboro passing game. Senior Sam Fasoldt will be joined by juniors Julia Reyes and Ashley Dame, who returns after missing 2017 with a knee injury, and sophomore Jessica Gates. Junior Sophia Salviati will help out in midfield and defense, where Attleboro returns just one starter from last year. Seniors Felicia Laguerre and Ashley Lauzier will be at the heart of the defense in front of goalies Taylor Drake (senior) or Ashley Macia (junior). 2017 Finish: Reached Div. 1 South first round. Franklin battled injuries throughout the 2017 season and those injuries tested the Panthers depth, but heading into a new season head coach Tom Geysen is confident that this year’s squad can withstand the rigors of Hockomock play. The Panthers will be tested early, with King Philip, Mansfield, and Canton in the opening four games. Versatility will be a key for the Panthers this season with players capable of slotting into different positions. One of those players is junior Anna Balkus, who can play up top or drop back into the midfield depending on the formation. Sophomore Sydney St. Marie will also play up top and Geysen said that she has shown real progress from last year. Junior Carly Alston will be in the heart of the midfield, while senior Halle Atkinson will give Franklin an outlet on one wing and sophomore Erin Qualie, fresh off an impressive rookie campaign, will be on the other. Defensively, Franklin will count on third-year center back Grace Gallo, fellow senior Maddie Stewart, and junior Sabrina Addi, who moved from the midfield to defense last fall. Athletic junior Breanna Atwood will jump into goal and continue Franklin’s run of strong goalkeepers. 2017 Finish: Reached Div. 1 state semifinal. King Philip put together a dominant season in 2017, winning a league title for the first time since 2002 and then winning the Div. 1 South title as well. The Warriors scored 18 more goals than any other team in the Hockomock last year and also allowed fewer goals than all but two teams. With a loaded roster back this fall, KP has its sights set on even more in 2018. Expectations are sky high for the Warriors this season because of the return of junior forwards Chloe Layne and Avery Snead, the reigning league MVP and HockomockSports.com Player of the Year. Layne and Snead were the top two scorers in the Hock last season and they continue to develop and improve. KP wasn’t a two-player team and they will also count on senior Abby Baker in the midfield along with wingers Makayla Griffin and Ally Stanton to provide outlets when defenses crowd the forwards and close down the middle of the park. Junior Olivia Berry will be in the heart of the defense and look to provide the leadership and physical play of graduated defender Emma Corcoran. Junior Faye Veilleux also stepped in at the end of last season and showed her growth as a defensive presence in midfield. While King Philip earned a lot of attention for their run to the state semifinal, Mansfield was equally as strong in the league last year. The Hornets matched the Warriors step for step and earned a share of their second straight Kelley-Rex division title. With a number of players back again this year, Mansfield looks ready to battle for a three-peat and make a deep tournament run. The Hornets feature 13 seniors on this year’s roster, so experience won’t be an issue. Melissa Reef and Bryn Anderson headline the midfield group, with Reef providing cover for the back line and Anderson acting as the fulcrum that gets the offense in motion. The defense will be spearheaded by Emily Vigeant, who has been on the top defenders in the league for the past couple of seasons. She is joined by versatile and physical defenders like Mikaela Maughn, Kerina Geminiani, and Erin Daniel. Goalkeeper Lauren Whitman will be back between the sticks this season. There will be plenty of depth in the Mansfield attack this fall with Stephanie Kemp, Sydney Mulkern, Amanda Mangano, Cassidy McMahon, and freshman Maria Sevastos all expected to contribute. “We will be hoping to spread out the offense amongst multiple attackers,” said Mansfield coach Kevin Smith. Oliver Ames had a number of new faces last year, but the Tigers were still able to earn a postseason appearance and were the only team in the league to beat King Philip during the regular season. With another year of experience, OA should be ready for another postseason run. Defense should be a strength for the Tigers this season with plenty of varsity experience on the back line, including seniors Gabriele McLaughlin, Maeve Hogan, and Brianna Gibson. The defensive unit will help sophomores Emma O’Donnell and Emily Meyers get comfortable in goal, as they try to replace EMass all-star Regan Benton. 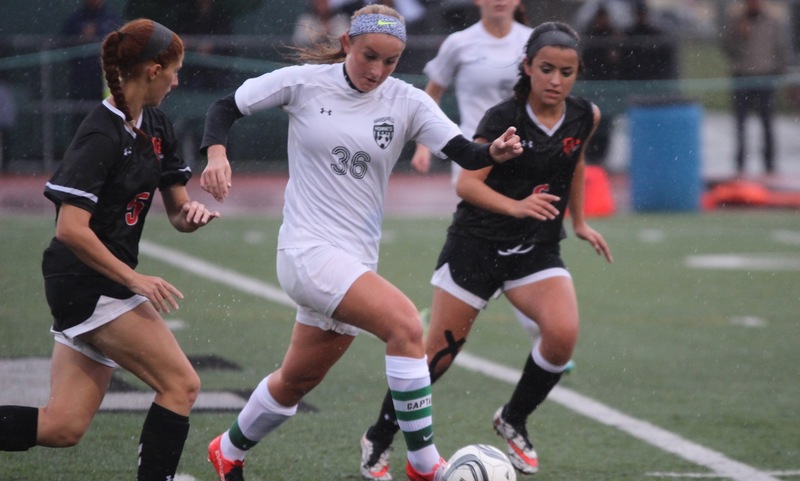 Junior Abby Hodges will be a key component in the OA midfield this season. Junior Erin Holmberg and senior Maggie Ault will be up front for the Tigers, who will hope to improve on the 31 goals they scored last year. It has been a few seasons since Taunton made history with a trip to the postseason and a road playoff win at Wellesley, but the program is continuing to build and head coach Edith Dixon expects the Tigers to be an “interesting” team in 2018 with a mix of youth and experience. Taunton will clearly miss leading scorer Sam Tichelaar and defensive stalwart Kayla Felix, who both graduated after last season, but there is a lot of talent for the Tigers to build around. Grace Pimenta will be back between the pipes and her aggressiveness off her line will help the Taunton defense. Maggie Sullivan will be counted on to be the field general in midfield and Dixon praised her “never-ending motor.” Up front, speed will be a strength for the Tigers, who are hoping to use it to create numerous chances in transition and being aggressive attacking the opposition goal. Goal scoring has been the biggest issue for the Bombardiers in the past few seasons, including a league-low eight in 2016, but head coach Steve Santos is confident that this year’s squad has the speed and experience to take advantage of counter attacks and he expects Attleboro to create a lot more scoring chances this fall. While goal scoring is a focus of the preseason work, it is at the back that Attleboro boasts the most experience with the entire back line returning. Senior Jordyn Forte is the leader at the back, using her “good soccer IQ,” according to Santos, to keep things calm and making the right plays. She is joined in the defense by fellow seniors Morgan Laplume and Graycen Cassidy. In goal, Madison Brown returns to give Attleboro a solid presence to control the penalty box. Turning that defense into attack will be the responsibility of senior midfielder Julia Hayes, who will be a key player in the center of the pitch. Junior Ashley Lauzier and senior Kara Thornton will be hoping to take advantage of the opportunities that are created. Santos is also excited about the youth coming into the program with three freshman on the varsity roster to start, including Riley Harnois, who will help out in the attack. After six straight league titles, Franklin had an atypical season in 2016. The Panthers only lost three times all season, but drew five times, struggling to find consistent goal scoring that would turn a tie into a win. Franklin only allowed nine goals, but only scored 36, which was 20 goals fewer than league champ Mansfield. This year, head coach Tom Geysen is working on a new formation to get the best out of his attacking options with the goal of returning to the top of the league standings. The Panthers return leading scorer Miranda Smith and the senior takes advantage of her size to create scoring opportunities in the box. Junior Halle Atkinson is back for her third year on the varsity and gives Franklin speed on the wings and is an accurate crosser of the ball to give Smith plenty of chances. Molly Duncan and Ellie Teixeira are also back and will give the Panthers a consistent presence in the center of midfield, while Emily Mastaj is another option on the wing. The key to Franklin’s defense this season will be senior goalie Cat Robbins. Stepping in between the posts last year, Robbins turned in an impressive year and quickly became one of the top goalies in the league. This year, there will be several new faces and younger players that will be counted on to step up on the defensive side of the ball, including senior Molly O’Reilly and juniors Grace Gallo and Madison Stewart. It was a great turnaround for King Philip from 2015 to 2016. The Warriors were snakebitten by injuries the year before, losing almost an entire starting 11 many of them to long-term injuries, but last year a large and talented freshman class stepped in to supplement the players who were back healthy helping the program jump from just two wins to 12 last fall. Expectations are even higher for the Warriors this year, as that freshman group gained a year of experience playing in the Hock. The sophomores are led by Avery Snead, last year’s Underclassman of the Year, who excelled up front or in the midfield and sealed the team’s playoff victory over Mansfield with an overtime headed winner. Chloe Layne showed off silky skills and finishing ability in the box and Olivia Berry stepped right into the heart of the defense and showed that she belonged. It is not all about the underclassmen. Senior Emma Corcoran is back for another year at the heart of the defense and as the primary dead ball specialist, being named an Eastern Mass. All-Star in 2016. Senior Emma Durant has grown into the role of starting keeper and was a solid and steady presence between the posts last season. Senior Julian Massarone is a three-year varsity player and will be one of the primary playmakers in the center of the pitch. Mansfield is coming off the program’s best ever season. The Hornets set records for wins, points, goals scored and claimed their first ever league title, finishing the regular season unbeaten. An overtime loss in the first round of the playoffs to league rival KP was a tough finish to 2016 and trying to replace the production of HockomockSports.com Player of the Year Hannah Reiter will be a challenge, but the Hornets return a ton of talent to make a run at another title. Juniors Melissa Reef (an Eastern Mass. All-Star last season) and Bryn Anderson will be back in the midfield this fall, breaking up opponents’ attacks and pushing Mansfield into the attack. Their ability to cover a lot of ground in the center of the pitch and pick out the right pass to start the transition will be key. 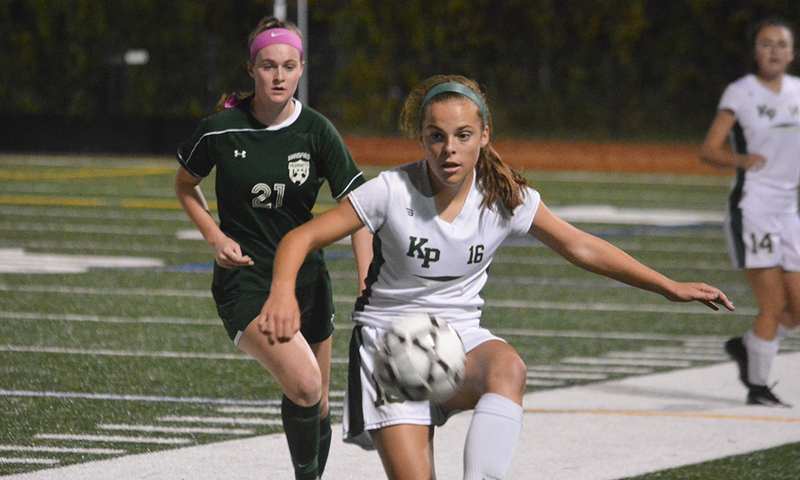 Classmate Stephanie Kemp will be back at the top of the attack, after scoring nine goals as a sophomore. Junior Emily Vigeant will lead an experienced defensive unit and also gives the Hornets a dangerous weapon from set pieces. Mansfield coach Kevin Smith likes has a lot of players that he can call on this season. In the attack, Kemp will be joined by Sydney Mulkern, Allee Bezeau, Amanda Mangano, Cassidy MacMahon, and Emma Oldow. Defensively, the Hornets will turn to Mikaela Maughn, Kerina Geminiani, Erin Daniel and goalkeeper Lauren Whitman. Last fall, Oliver Ames made the switch from the Davenport to the Kelley-Rex division, but it had little effect on the success of the program. The Tigers shared the league title with Mansfield, the fourth title in a row for OA and seventh since 2007. That run of success may be tough to keep going this year, as the Tigers graduated 10 seniors and are battling injuries to start 2017. Losing players like Francesca Calabraro (who was injured midway through last season) and Kiana Lozzi is tough enough, but the Tigers lost almost an entire starting 11. To make matters worse, the strong central defensive pairing of Emily Freeman (knee) and Zoe Chazan (academy) are both missing to start the season. Senior goalie Regan Benton is back and will give the Tigers one of the best goalies in the league and in Eastern Mass. to backstop the rebuilt defense. Offensively, the Tigers have been known for pace and strength, particularly on set pieces, and this year will count on three senior to try and provide consistent scoring opportunities. The pacy group of Abby Reardon, Jackie Mills, Annabella Walsh will be the primary focus of the attack. There will be a lot of new faces on the pitch this season, trying to keep the legacy of OA success going for another fall. It has been a roller coaster ride for the Tigers over the past few seasons under head coach Edith Dixon. In 2015, Taunton reached the postseason for the first time in program history and made it count by beating Wellesley on the road in the opening round and gave top seed Bishop Feehan a tough game in the second round. But, after losing a number of players to graduation, Taunton won only three games last season and are looking to bounce back behind a young roster in 2017. The key for the Tigers is senior Samantha Tichelaar, who is coming off a league all-star and HockomockSports.com Best XI season, and gives Taunton speed, control, and leadership either as a forward or dropping deep into the midfield. Her versatility opens opportunities for her teammates. Classmate Kayla Felix will be the leader at the back for the Tigers, adding aggressiveness to the defense from her sweeper position. The Bombardiers won six games last year, including an upset of rival North Attleboro in the annual Blue-Red Game near the end of the season. Head coach Steve Santos is hoping that the momentum will carry over for his relatively inexperienced group this fall. The Bombardiers return 10 players from last year’s roster but not all were regular contributors. “They need to play simple and play quick,” said Santos, who mentioned that the program is developing with three freshmen seeing time in scrimmages. The loss of Paige Medeiros to graduation leaves a big hole to be filled, especially with her set piece prowess, but Attleboro will turn to senior attacking midfielders Rebekah Entwhistle and Chloe Vieira to produce the killer pass and set up scoring opportunities. Up front, Hannah Meier will be counted on to finish those chances and give Attleboro the scoring punch it needs. The Class of 2016 won a state title, two Div. 1 South titles, went to three straight South finals, and won the Kelley-Rex division four times. That is quite a legacy for the program and, while he has a number of new faces to try and incorporate into the lineup, head coach Tom Geysen is confident that this year’s Panthers will be team to contend with by the end of the season. One reason for optimism is the combination of sophomore Halle Atkinson and junior Jess Krouschl up front (once Kroushl comes back from a niggling injury). Both players saw time in the attack last season and showed the potential to be a strong pairing with one as the forward or playing as the wings. The forwards will be helped by energetic midfielders Molly Duncan and Ellie Teixeira, two more players who saw plenty of playing time down the stretch in 2015. Defensively, Franklin returns one half of its back four. Nadia Havens will continue as an outside back, while Abby Gibson, who stepped in to have a strong season on the outside last fall, will move in as one of the centerbacks. Junior Kat Robbins will take over from Dani Lonati between the pipes. The Warriors did not just have an injury or two to deal with in 2015, but almost entire starting 11 ended up with injuries that left King Philip head coach Gary Pichel scrambling to fill roster spots with players from the JV and freshman teams. As 2016 begins, many of the key players are back and healthy and the Warriors are hoping to spring a surprise on the Kelley-Rex. Junior defender Emma Corcoran (“the heart and soul” of the defense, according to Pichel) has been a rock in the middle of the back line and will have a lot more help with seniors Sarah Fleck (ACL) and Katherine Turner (ankle) back after missing all but one game last year. Corinne Palumbo and Julia Massarone will also chip in from the midfield and will be counted on turning defense into attack quickly. The Hornets are only bringing back three players who started regularly last season and that includes two goalkeepers. Senior Emily Gaumond started the season in net but missed the final month with a concussion, which meant that then freshman Lauren Whitman had to step in between the pipes. The only returning outfield player is senior Hannah Reiter. The Quinnipiac University-commit, who comes into the season as a contender for Player of the Year, was a standout in central defense, midfield, and up front last year. While Mansfield does not return a lot of starters, there is plenty of experience on the roster. Head coach Kevin Smith utilizes a large roster and makes sure that a majority of the players get time on the field. Senior forward Emma Goulet and senior defender Emily Sullivan will be the captains and each has multiple seasons on varsity. Sophomore Stephanie Kemp and junior Allee Bezeau will be counted on to provide scoring punch and sophomore Melissa Reef will be taking a bigger role in the midfield this year. The Tigers have won the Davenport division each of the past three years and will now set their sights on claiming the Kelley-Rex title at the first opportunity. Head coach Britt Sellmayer has a squad capable of claiming the crown and with the potential to make a deep tournament run as well. With seven returning starters, including four league all-stars, and 10 seniors, the Tigers have the most experienced roster in the Kelley-Rex and arguably the deepest. It starts with reigning Hockomock MVP Francesca Calabraro. The senior scored 24 goals last season and has been talked about as a potential All-American in the preseason. With Calabraro moving between a midfield and a forward role, it opens up space on the wings for the speedy Jackie Mills, who chipped in with nine goals last year and could be ready for a breakout junior season. 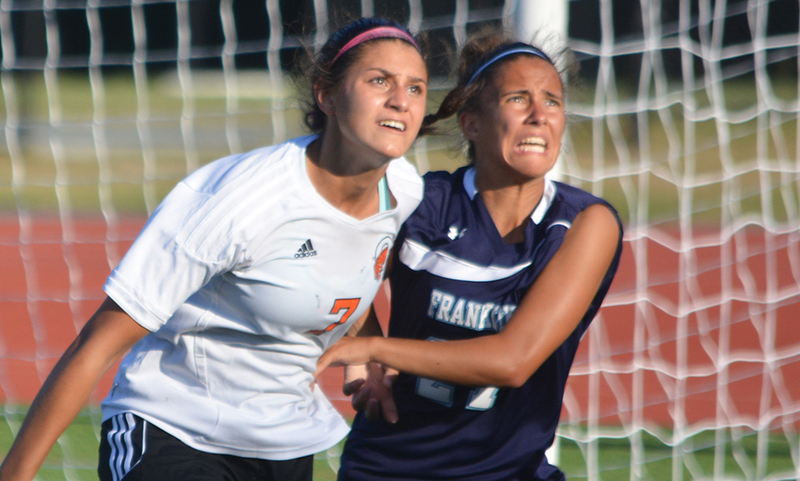 Seniors Dana Lowney and Jess Robarge will also provide midfield support for the Tigers. The Tigers made history last season, becoming the first team in the program’s history to win a playoff game, knocking off Wellesley on the road. That Taunton team was filled with upperclassmen but head coach Edith Dixon wants the program to keep moving forward and believes that there are players ready to step up and take over. One of the players leading the way for Taunton is senior captain Emily O’Brien, who Dixon credits with setting the tone at practice. The Tiger will turn to junior Sam Tichelaar for offensive production as the three-year starter is healthy after an injury-plagued sophomore campaign and is ready to be the “driving force” in the Taunton midfield. Senior Livi Sweeney will be the forward for Tichelaar to connect with up top. Today games are listed below. #3 Oliver Ames, 3 vs. #9 Masconomet, 1 – Final – Masco took the lead in the 13th minute but goals from Chris Romero and Nathaniel Cardoza put Oliver Ames up at halftime. Thomas McCormick added a third for the Tigers in the second half off an assist from sophomore Matt Alvarado. This is the first time in program history Oliver Ames has won a state title. White/Blue Team, 7 vs. Gold Team, 1 – Final – Milford’s Justin Borges scored the lone goal of the first half in the 28th minute to give White a lead at the break. Nine minutes into the second half, Foxboro’s Anthony Barreira doubled the lead and just four minutes later Stoughton freshman Fabio Ponce de Leon got on the end of a cross from North Attleboro’s Matt Coscarella to make it 3-0 White. Stoughton’s Tyler Melo flicked in Barreira for his second of the game and three minutes later, Melo touched to Franklin’s Austin Kent who found Barreira for his hat trick to make it 5-0. Sharon’s Jake Goloboy and King Philip’s Cam Mullins added goals within a minute to make it 7-0. Taunton’s Austin Botelho got on the end of a scramble inside the area in the final minute to get Gold on the board. Thank you to Stoughton head coach Aaron Salter and Attleboro assistant Steve Rodrigues for coaching. Rosters for the game can be viewed here. White/Blue Team, 5 vs. Gold Team, 3 – Final – North Attleboro’s Hana Caster put White up five minutes into the game but Franklin’s Victoria Stowell leveled the match in first half extra time off a free kick from Oliver Ames’ Zoe Chazan. Attleboro’s Rebekah Entwistle pushed White ahead shortly after the break but Victoria Stowell pulled it even within a minute. Mansfield’s Jen Kemp have White another lead in the 50th minute but Canton’s Sarah MacQuarrie linked up with Attleboro’s Paige Medeiros to make it 3-3. Kemp grabbed her second of the game to make it 4-3 and with 10 minutes to play, Franklin’s Alexis Stowell added a fifth goal for Gold. Thank you to Stoughton’s Tara Daniels and Taunton’s Edie Dixon for coaching. Rosters for the game can be viewed here. WELLESLEY, Mass. 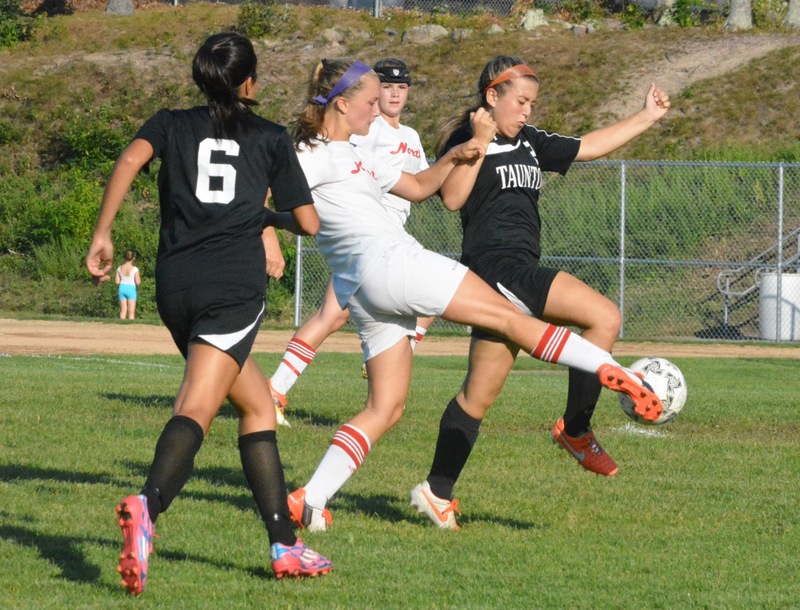 – Just two seasons ago, the Taunton girls’ soccer program won a single game. Last year, the Tigers improved to six wins and on Wednesday afternoon at Sprague Field the program made history when it kicked off against Wellesley in its first ever state tournament game. Thanks to a brace from sophomore Samantha Tichelaar and a goal and an assist from senior Alana Vincent, the Tigers continued their historic run with a 3-1 victory in the preliminary round of the Div. 1 South sectional. “For the seniors, we’ve all been playing with this program for five years,” said senior goalie Kayla Wentworth, “so it’s kind of crazy. I’m proud of my team for working so hard. Taunton coach Edith Dixon also remarked on the work that the players have put in over the past two years to not only be competitive with the top teams in the Hockomock but also to now have success in the state tournament. If the Tigers had any nerves stepping into their first postseason game, they did not show any in the early going. Abby Small forced an earl save with a curled free kick from the edge of the box and Vincent nearly opened the scoring when she ran onto a flicked header by Tichelaar and had her shot deflect narrowly wide. In the 12th minute, Taunton got the lead. Vincent played a corner from the near sideline that curled to the back post where Tichelaar was on hand to knock it in with her knee. “It’s really important to get their confidence up, keep moving forward and really get the momentum started and to establish that the other team is going to have to chase us,” said Dixon about the opening goal. The Raiders started to get into the game with Kayleigh Harris having the home team’s first chance on a corner but she skied the loose ball over the bar. Shortly after, the Raiders took a timeout midway through the first half to settle things down. Taunton nearly doubled it’s lead just minutes after the timeout, but Small’s dipping free kick hit the underside of the bar and the officials ruled that it did not cross the goal line. The ball bounced to Tichelaar but her header went wide of the far post. The miss hurt as the Raiders almost immediately equalized. A Wellesley counterattack caught the Tigers back line square and Emmaline Ivey ran onto a ball over the top and was one-on-one with Wentworth. Ivey took a couple touches before firing a shot into the side-netting. The goal slowed the Tigers attack for a few minutes but Taunton recovered and once again started to put pressure on the Raiders defense with quick outlet passes into Mariah O’Gara, Vincent and Tichelaar. Five minutes before the break Vincent ran onto a through ball in the right channel and carried the ball towards the byline. From a very acute angle, the Tigers leading scorer fired a shot through the Wellesley keeper and inside the far post to make it 2-1. Even with Small hobbled and forced to stalk the sidelines with a giant bag of ice on her knee, Taunton came out strong in the second half. Just nine minutes after the break, Maggie Sullivan took a shot from distance that bounced up and over the Wellesley keeper. Tichelaar read the bounce and was first to the loose ball for her second goal and a two-goal advantage for the Tigers. “Ugly goals count just as much as pretty goals, so I’ll take it,” joked Dixon. Wentworth was nearly beaten by a similar bounce just minutes later as she stared into the sun trying to read a free kick by Lucy Acuna. Luckily for the Tigers, the ball bounced up off the bar and out. The game was physical throughout with neither team backing down. 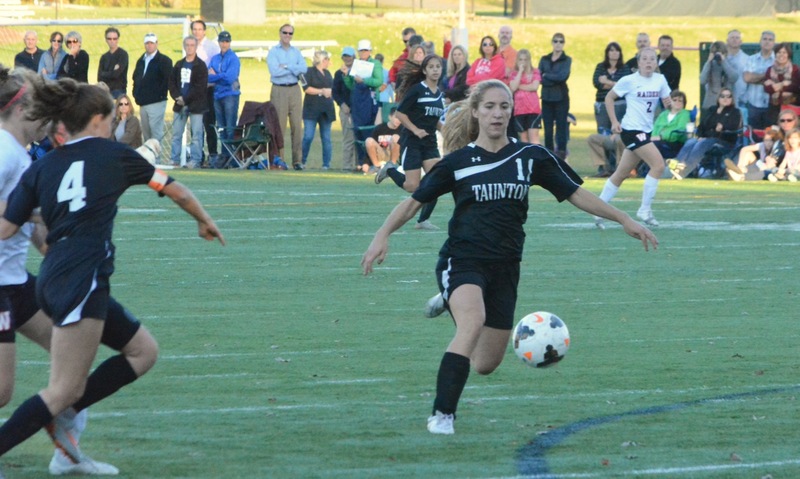 Wentworth would make six saves but the Taunton defense, led by senior Emily Serpa, kept chances to a minimum to run out the clock on a historic win for the program. Now, the Tigers (9-8-3) can turn their sights to facing No. 1 seed Bishop Feehan on Friday. The Tigers seem ready to go and looking forward to the challenge. Josh Perry can be contacted at JoshPerry@hockomocksports.com and followed on Twitter at @Josh_Perry10. Click HERE for photo gallery from the game. NORTH ATTLEBORO, Mass. – North Attleboro had dominated possession for much of the first half, had the vast majority of the chances, and at one point held a three-goal lead, but with the first half winding down Taunton had cut the lead to just one goal and had the momentum. Just moments before the half ended, sophomore Felicity Monfils flicked a pass from midfield between a pair of defenders to allow classmate Haley Guertin to run on to it. Guertin held off the defenders and managed to slide her shot just inside the far post to restore a two-goal lead. It was Guertin’s third goal of the first half and turned out to be the game-winner, as North Attleboro pulled out a 5-3 victory over the Tigers on Friday afternoon at Thomas Kelly Field. The opening 20 minutes was all North Attleboro. The Rocketeers front three of Haley Guertin in the middle, Monfils on the right and Hana Caster on the left, with Grace Guertin stepping forward from midfield, overwhelmed the Tigers defense early in the game. It was Monfils who opened the scoring when Caster created space on the left and cut the ball back into the box for Grace Guertin, whose shot was blocked into the path of Monfils. The sophomore took a touch and buried her shot past Taunton keeper Kayla Wentworth. The Rocketeers were swarming the Taunton defense. Haley Guertin stole the ball off the center back and had a shot from 20 yards but it snuck wide. Just a minute later and she had her first goal. Wentworth went out to the edge of her box to challenge Caster. An attempted pass was blocked to Shannon Kingsley and she looped a ball back across goal toward the far post. It may have snuck in either way, but Guertin took no chances and nodded home from a yard out to make it 2-0. As the half approached its midway point, Caster switched to the right and sent in a cross that eluded Wentworth and found Guertin all alone at the far post for another tap in. Trailing by three goals with the game not even 20 minutes old, Taunton could have given up and the game could have gotten out of hand. Instead, the Tigers found a goal and some momentum. Mariah O’Gara threw a warning shot when a ball bounced over the North defense on a goal kick and her shot just missed at the near post. A minute later and Taunton broke quickly again with Sam Tichelaar springing Alan Vincent in the right channel. Her shot was saved by Kiersten Bixby into the path of O’Gara whose rebound attempt was also blocked but who scored on the second attempt. The goal sparked Taunton with some help from Wentworth on the other end, who made seven saves in the first half alone to keep North at bay. Tichelaar gave Taunton even more reason for optimism late in the half when she stole the ball from Rachel LaBonte and raced towards goal. The sophomore gave Bixby absolutely no chance with a fantastic finish under the bar and suddenly it was 3-2. If North was starting to get nervous, Haley Guertin ended the concern right before halftime with a side-foot finish inside the far post for her hat trick. Just two minutes into the second half and Guertin turned provider as her cross from the left was met by Caster in the middle. The senior settled it spun to her right foot and lifted it over Wentworth to make it 5-2. The second half featured far less North possession than the first and far less chances for either team. Taunton did manage a third goal in the 60th miniute on a ball that bounced several times on the right edge of the box that was chased down by O’Gara. She stepped past her defender, saw that Bixby was anticipating a cross and fired a shot in at the near post. It would be one of the last clear-cut chances for either team in the game, as North Attleboro worked to just see out the result. Regardless of the loss, Dixon saw a different attitude from her team as it battled back from the early deficit in each half. North Attleboro, still in high from its first win at Oliver Ames in 13 years, will get its first look at the King Philip turf on Monday. Taunton will look to bounce back against Attleboro.